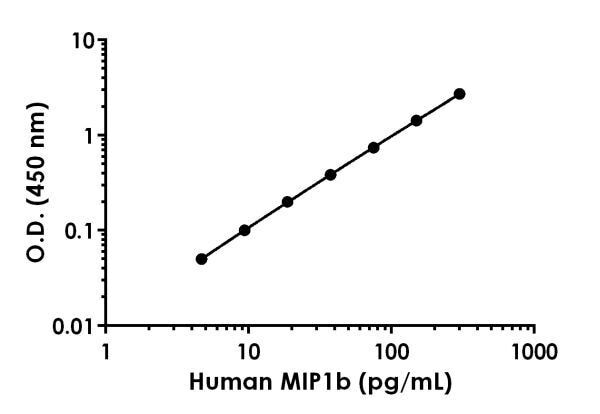 Human MIP1b SimpleStep ELISA kit (ab178010) has been re-developed with new capture and detector antibodies. This new kit has the same name but a different product number (ab216173). We have identified new recombinant monoclonal antibodies to use in the SimpleStep ELISA platform that provide a higher sensitivity when quantifying IL-17A in human serum, plasma and cell culture supernatants. MIP1b in vitro SimpleStep ELISA (Enzyme-Linked Immunosorbent Assay) kit is designed for the quantitative measurement of MIP1b protein in human serum, plasmas, and cell culture supernatant. MIP-1-beta (CCL4) is a monokine with inflammatory and chemokinetic properties. MIP-1-beta binds to CCR5 and is one of the major HIV suppressive factors produced by CD8+ T-cells. Recombinant MIP-1- beta induces a dose-dependent inhibition of different strains of HIV-1, HIV-2, and simian immunodeficiency virus (SIV). The processed form MIP-1-beta (3-69) retains the abilities to induce down-modulation of surface expression of the chemokine receptor CCR5 and to inhibit the CCR5-mediated entry of HIV-1 in T-cells. MIP-1-beta (3-69) is also a ligand for CCR1 and CCR2 isoform B. Structurally, MIP-1-beta forms a heterodimer with MIP-1-alpha (4-69) and is secreted from peripheral blood lymphocytes. Monokine with inflammatory and chemokinetic properties. Binds to CCR5. One of the major HIV-suppressive factors produced by CD8+ T-cells. Recombinant MIP-1-beta induces a dose-dependent inhibition of different strains of HIV-1, HIV-2, and simian immunodeficiency virus (SIV). The processed form MIP-1-beta(3-69) retains the abilities to induce down-modulation of surface expression of the chemokine receptor CCR5 and to inhibit the CCR5-mediated entry of HIV-1 in T-cells. MIP-1-beta(3-69) is also a ligand for CCR1 and CCR2 isoform B.
N-terminal processed form MIP-1-beta(3-69) is produced by proteolytic cleavage after secretion from peripheral blood lymphocytes. Our Abpromise guarantee covers the use of ab216173 in the following tested applications. Human MIP1b standard curve comparison data. 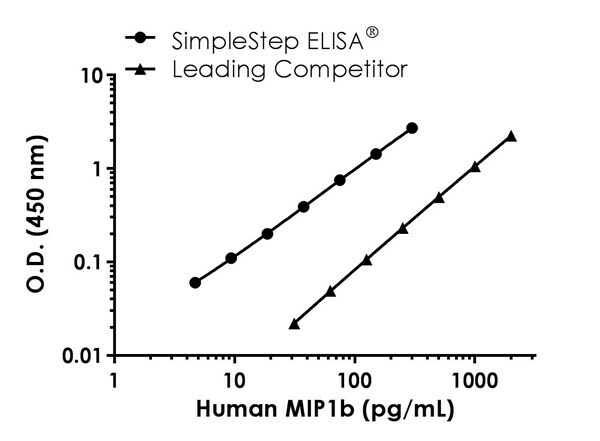 Standard curve comparison between human MIP1b SimpleStep ELISA® kit and traditional ELISA kit from leading competitor. SimpleStep ELISA kit shows a 3-fold increase in sensitivity. 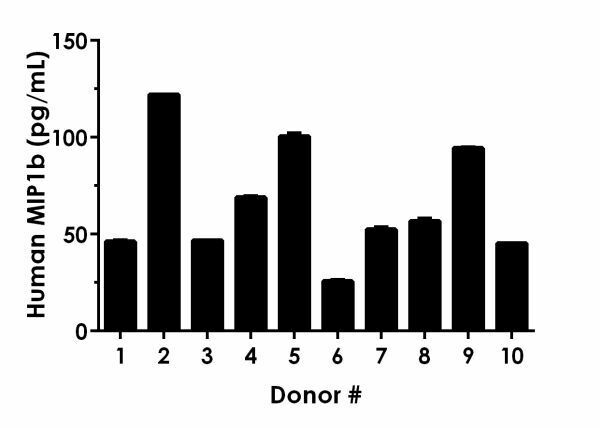 Example of human MIP1b standard curve in 1X Sample Diluent PTR. Interpolated concentrations of native MIP1b in human serum, plasma and cell culture supernatant samples. The concentrations of MIP1b were measured in duplicate, interpolated from the MIP1b standard curves and corrected for sample dilution. Undiluted samples are as follows: serum 50%, plasma (citrate) 50%, plasma (EDTA) 100%, plasma (heparin) 50% and stimulated PBMC supernatant 0.05%. The interpolated dilution factor corrected values are plotted (mean +/- SD, n=2). 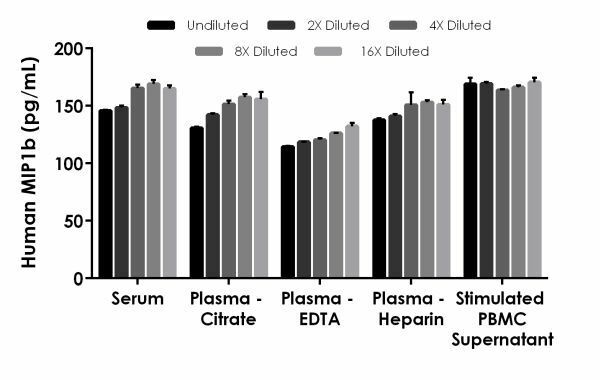 The mean MIP1b concentration was determined to be 159 pg/mL in serum, 147 pg/mL in plasma (citrate), 122 pg/mL in plasma (EDTA), 147 pg/mL in plasma (heparin), and 168 pg/mL in stimulated PBMC supernatant. Interpolated dilution factor corrected values are plotted (mean +/- SD, n=2). The mean MIP1b concentration was determined to be 66 pg/mL with a range of 26 – 122 pg/mL. 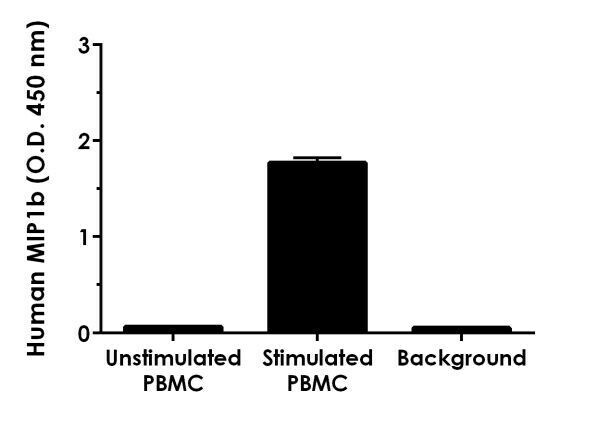 Comparison of raw values for stimulated vs. unstimulated PBMC supernatant samples. PBMCs were treated with 1% PHA-M for 4 days. ab216173 has not yet been referenced specifically in any publications. There are currently no Customer reviews or Questions for ab216173.